One of the reasons to love the instant pot is perfectly cooked brown rice. You don’t need to keep that extra rice cooker anymore and can free the counter space. Even though I love white rice, I try to include more and more brown rice in our diet as it is more nutritious than white rice (well, debatable!). 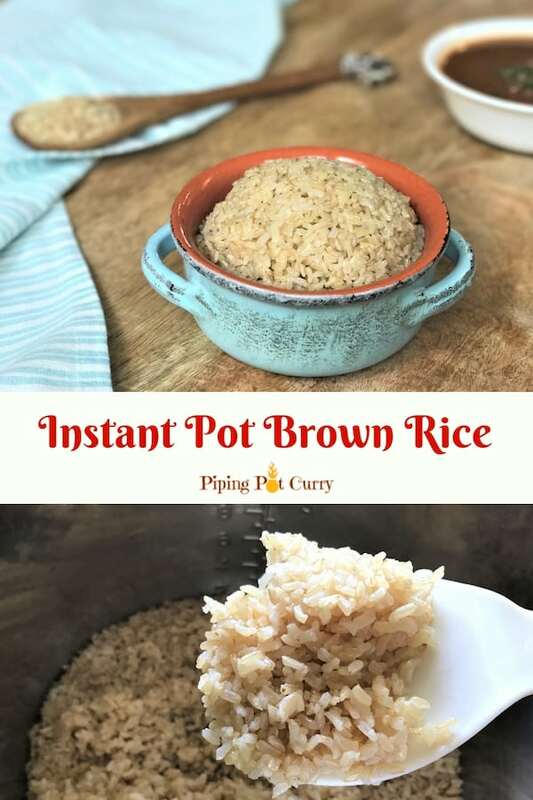 If you are looking for pot-in-pot (PIP) Brown Rice in the instant pot, go here. 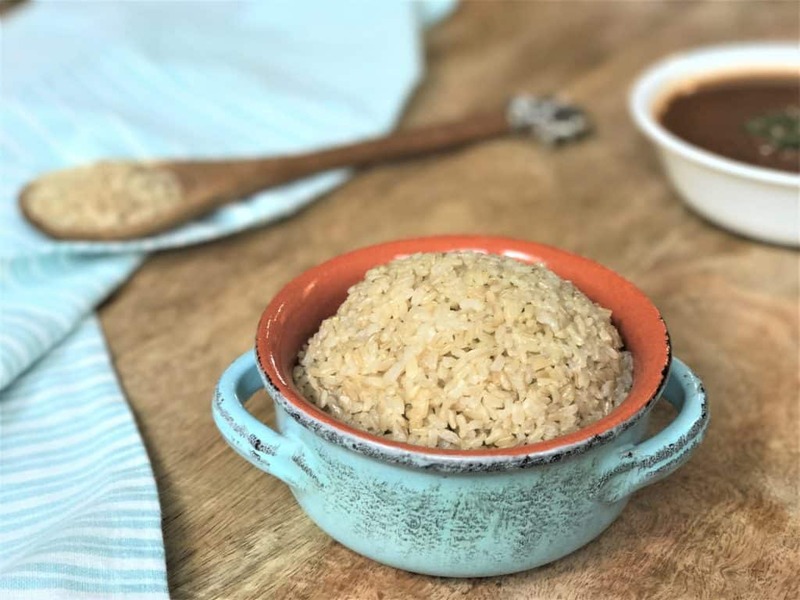 How to cook Brown Rice in Instant Pot? Cooking rice needs perfection on the amount of water and time. I was never able to get that for brown rice prior to using the instant pot. Sometimes there would be water left, sometime the rice would be undercooked. However now with the instant pot, I can always cook perfect brown rice. This is a no soak method. 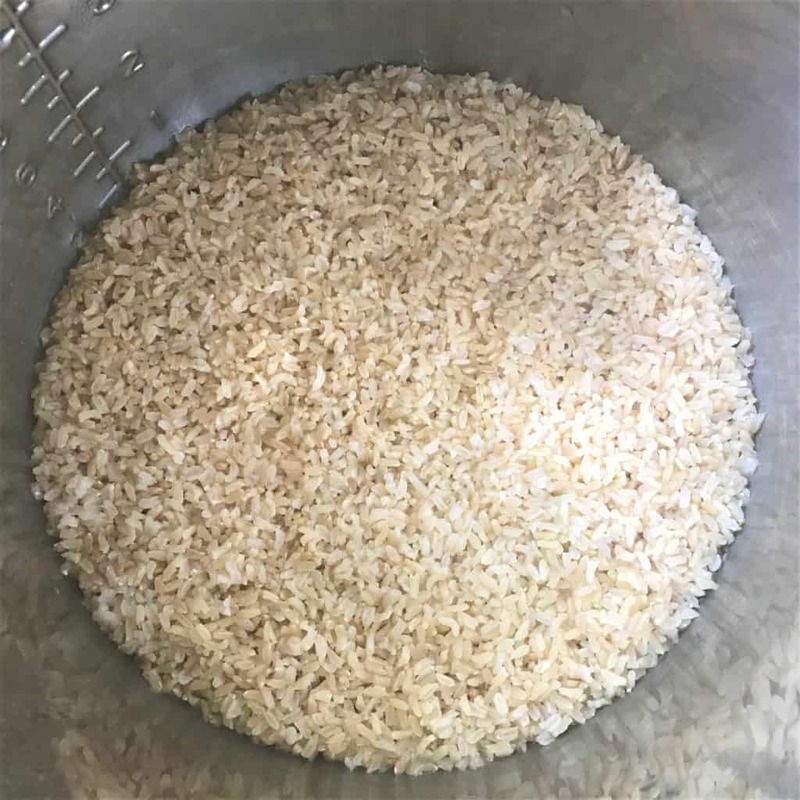 Just wash the rice, 22 minutes pressure cook (high pressure) in the instant pot and 10 minutes natural pressure release. Sounds easy…it actually is! 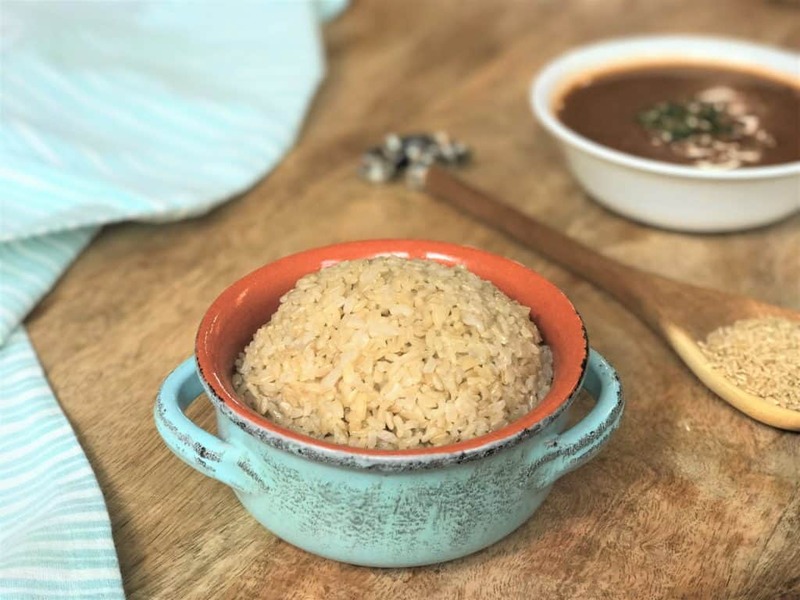 Enjoy this perfect brown rice with any curry such as Chana Masala, Chicken Curry and Dal Makhani. Try out the brown rice and let me know how it turned out. If you want to make Brown Rice using the pot-in-pot method (PIP), check out the recipe here. 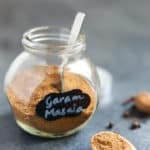 You can also check out other variations of rice – Basmati white rice, Jeera or Cumin rice or other basics recipes such as Steamed Broccoli and Instant Pot Beets . Perfectly cooked Brown Basmati rice made in an instant pot or pressure cooker. Wash brown rice until the water runs clear. Add water and rice to the instant pot insert. If using, add the oil and salt. Start the instant pot in manual or pressure cook mode for 22 mins at high pressure with vent in sealing position. 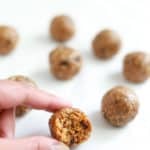 When the instant pot beeps, do 10 minutes natural pressure release, which means release the pressure manually 10 minutes after the instant pot beeps. Fluff the rice with a ladle or fork. Rice is ready to be served with your favorite curry. If you like very soft rice, then increase the amount of water by 1/4 cup. Cooking time remains the same even if you double or half the recipe. Perfect, perfect, perfect. Other recipes call for soaking, which is antithetical to instant pot cooking. 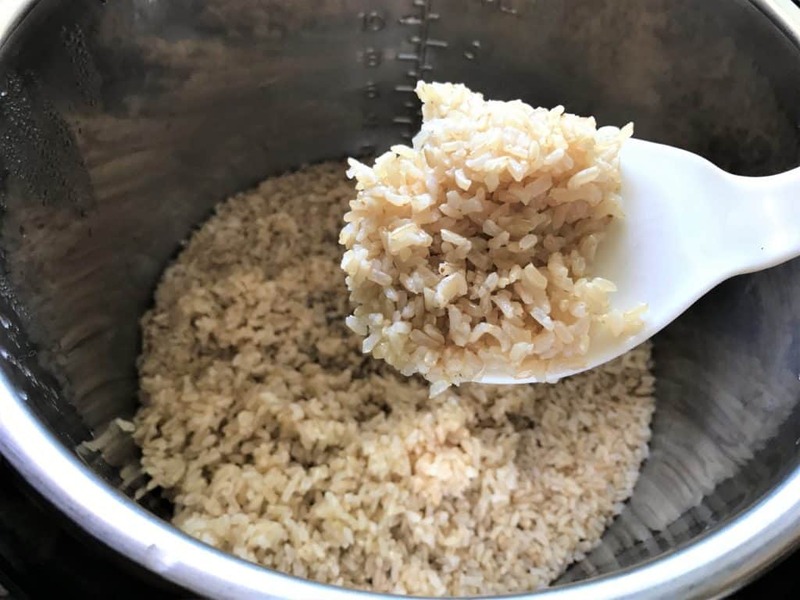 Hi Jan – Glad the brown rice came out perfectly! 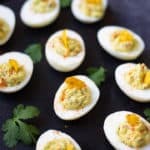 I was looking for an instant pot recipe specifically for brown basmati rice and this worked great! I used chicken stock instead of water though. Thank you! Hey Nicole – Glad the brown rice recipe worked well. Thank you for sharing back your review! This rice came out much better than my rice cooker. Thanks for sharing. Hey Ja Wo – So glad to hear the brown rice cooked perfectly in the instant pot. Thank you for sharing back your review. Well, this was perfect! It takes just about exactly the same amount of time as chopping vegetables and making stir-fry. Isn’t that great? Instant Pot has enabled parallel cooking. 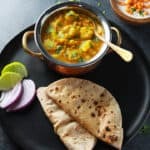 I am usually making a curry/lentils/beans in the instant pot, which making Indian flatbread and a starry veggie on the stovetop :-). Thank you for sharing back your review, Margeret! What if I want to make 12 cups of rice? Also can I use chicken broth instead of water? White basmati cooked in coconut milk is delish, I can’t wait to try it with brown. 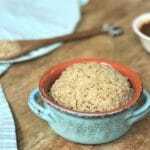 Hello Elisabeth – Chicken broth would definitely work in place of water in this brown rice recipe. Depending on the size of instant pot you have, increase the quantity of rice. I have heard readers made up to 5-6 cups of white rice in the 6qt instant pot. If you have an 8qt, you will be able to make more quantity. Just make sure you are below the fill line once the rice and liquid are added. Hope you enjoy it! Thank you! The basmati rice is perfect! Hey Kay – Glad to hear rice turned out perfectly. Thank you for sharing back! 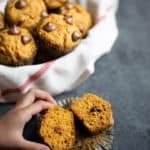 Will this recipe work for PIP (Pot in Pot Method)? Thank you so much – your instructions were PERFECT and saved me from another RiceFail! 🙂 I’ve been trying to figure out the ratio for my different brown rice varieties and it’s been a lot of ‘okay, it’s edible’ but nothing exactly right. Now I have ‘basmati’ , at least! Hello Paige – Glad the rice turned out perfectly. Thank you for sharing back!